On the loop line between Tunstall and Hanley were the stations at Burslem and Cobridge. Both of these stations were alongside or in the respective parks. Both Burslem Park and Cobridge Park can be accessed by the greenway which runs along much of the route of the old Loop Line. The Potteries Loop Line was completed as far as Burslem in 1873 with stations there and at Cobridge; the station on the main line was then named Longport instead of Burslem. 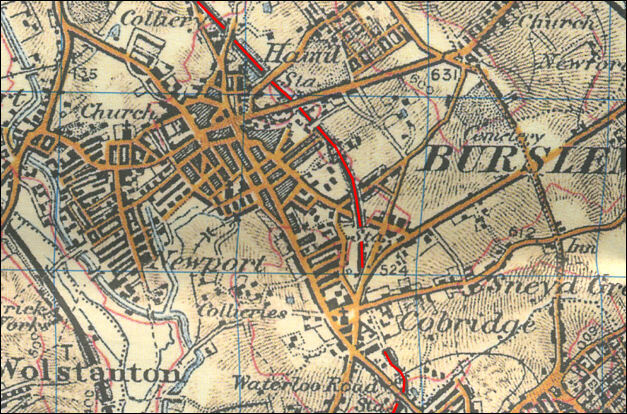 On the 1902 map below the Loop Line station at Burslem is called "Hamil Station", however in reality the station was nearer Moorland Road (where it was accessed from) and was generally called Burslem Station. The tree lined route of the greenway is easily visible on this map. 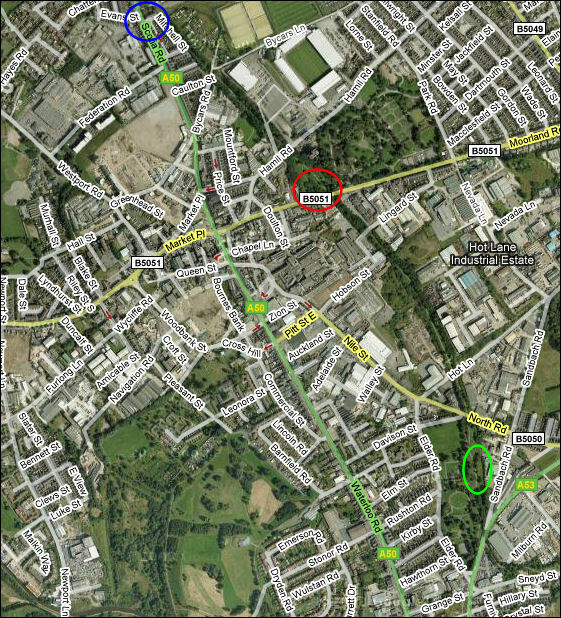 The blue circle on Scotia Road is near the Pinnox junction, the red circle is the location of Burslem Station - off Moorland Road and on the bottom edge of Burslem Park and the green circle is Cobridge Station in Cobridge park. "By mid-June, 1870, the directors of the North Staffordshire Railway were actively engaged in completing arrangements for the start of the long projected Loop Line and several contractors had been invited to send in tenders. The tenders of Messrs. John and William Pickering, of London, were accepted for the construction of the Potteries Loop Line and that of Mr. Mackay, of Silverdale, to make the Burslem branch line. On Thursday, July 21st, 1870, the ceremony of the cutting of the first sod took place in a very unostentatious manner at Burslem. The contractor, Mr. Pickering, accompanied by Mr. Forsyth, resident engineer, and other officials, arrived on the ground which was in Moorland Road, on the site selected for the station. With the barrow fully charged, the Chief Bailiff steered it along a plank and discharged the contents in a workmanlike manner, amid the cheers of the assembled spectators. The party then adjourned to the Leopard Hotel, in Burslem, where, by the liberality of the contractor and the Chief Bailiff, 'Success to the Potteries Loop Line was heartily drunk, in sparkling bumpers.' "